The most popular question we’re seeing on Twitter each day is easily, “When is [insert 4G device] coming out?” And even I’ll admit that it’s one of those topics I can’t get off my mind. The four devices that Verizon announced at CES were all amazing and it’ll be tough for anyone to decide which is the one to have, but maybe these little bits of information that we’ve receive will help you decide when you can jump on them. Let’s start with the HTC Thunderbolt. We broke the cover on this bad boy a few weeks before CES, and at that same time, we started seeing ads from HTC which claimed they would have another first to 4G. We quickly jumped on the idea that this could be out sometime in January or early February. And then it was officially announced at CES and Verizon was hesitant to give out any dates, but did mention that all of their devices would be out in the first half of 2011. Talk about a downer. The press release from HTC also removed their strong stance on being “first” and instead went with “one of the first” so we’re thinking there must be something else on the way. We’re still expecting it to be soon though, and all signs (tips) we’re receiving keep pointing towards an end of February or early-March release. An early March launch date gives Verizon time to sell the i*hone for a month, but also allows them to prepare their big marketing push which we’re assuming will be huge for these new 4G LTE devices. The Thunderbolt will definitely be one of the first, so put aside those last few X-mas pennies for a St. Patty’s day 4G party. 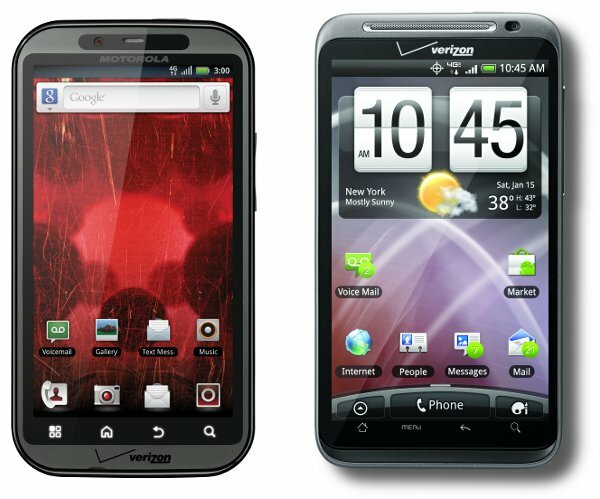 What about the DROID BIONIC though? This device is clearly the most coveted of the four with its dual-core processor, qHD screen and bold new look, but we’re getting the feeling that this may have customers waiting the longest. We heard a rumor that the BIONICs on-display at CES weren’t actually utilizing both cores and that battery life was still a significant issue. I can’t confirm that either way, but do know that every word we’ve heard has this device pushing that “first half of 2011” deadline. Don’t be surprised if the BIONIC leads Big Red’s big summer campaign. I should also point out that the Motorola Atrix 4G is now rumored to be landing on AT&T sometime around March 1st meaning Moto isn’t about to release the BIONIC anywhere near it. The Atrix is their new king and the last thing they want to do is hamper sales of it by releasing a similar device on Verizon at the same time. And then we have the LG Revolution and the Samsung SCH-i510 who seem to be the forgotten children. While there have been few tips on either of these devices, we’re starting to expect at least one of them early on and at the same time as the Thunderbolt. The Samsung device would surprise us as the device remains nameless at this time, but the hardware we played with seemed about as ready to go as you can get. The Revolution on the other hand looked to be done, but then we keep getting unofficial specs, skinned and non-skinned versions, etc. so our initial thoughts on this device being ready for prime time could be way off. We know that HTC isn’t as firm on being “first” anymore, so look for one of these two to tag along with it on an opening ride. Lastly, we should probably touch on the Motorola XOOM, the first ever Honeycomb tablet that will eventually be upgradeable to 4G LTE. Q1 2011 was all the talk at CES and with rumored shipment numbers coming out early this week, we can only assume that this timeframe is still a go. While the device is definitely not shipping with an LTE radio in it, talk of a major Super Bowl campaign sound incredibly solid. The first tease will likely happen on February 6th with a much broader campaign taking us through February. Expect the XOOM to hit stores around the same time as the Thunderbolt. Now, take this all as speculation at this time. We’re just going with every little detail that’s been dropped at our doorstep and are then attempting to piece the story together. All I can say is, can these get here fast enough? Anyone else bored with all of the current devices?